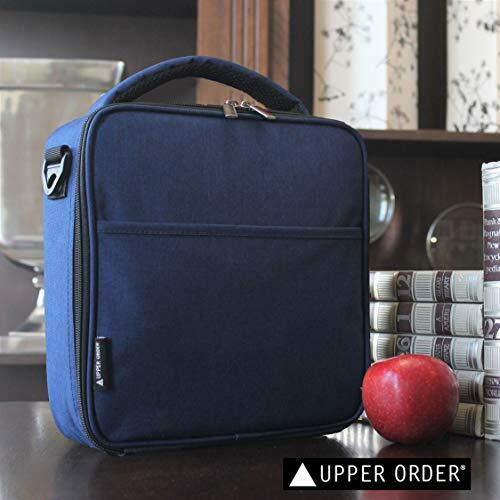 UPPER ORDER lunch bag is a ruggedly constructed, stylish, and easy to use lunch bag that was designed to provide years of long-lasting value. Rugged Exterior Fabric: Heavy-Duty 600D Polyester Oxford cloth canvas material in charcoal gray hides dirt and resists tears, scuffs, and stains. Cleans up easily with soap and water. Break-Resistant Zipper: Premium quality zipper holds up to daily use. 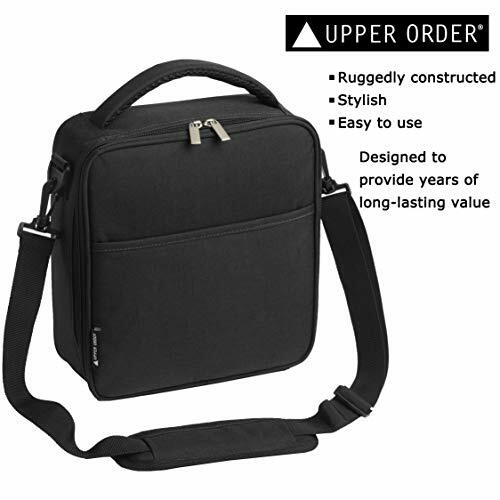 Collapsible Construction: Lunch bag can be collapsed to less than half its height for easy storage when empty, but when full the bag holds its shape well and stays looking good for years of continued use. 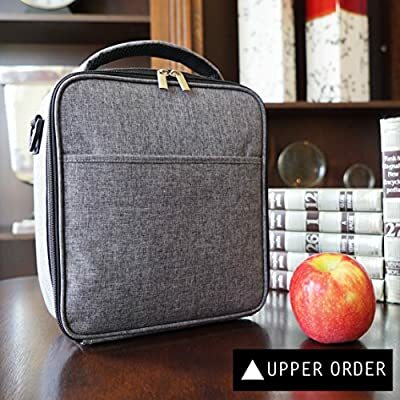 Extra Storage: Contains one interior pocket for food, napkin, and utensil storage and one exterior pocket with a Velcro closure for keys, cell phones, business cards or other small items. Easy Access: Ergonomically-friendly zipper placement allows lunch bag to open completely so it is easy to pack and unpack food. Easy-to-Clean Liner: Liner cleans quickly with soap and water so surfaces in contact with food stay sanitary. Upgraded Shoulder Strap Fasteners: Shoulder strap attaches to lunch bag with fasteners made with reinforced plastic construction designed to last longer. 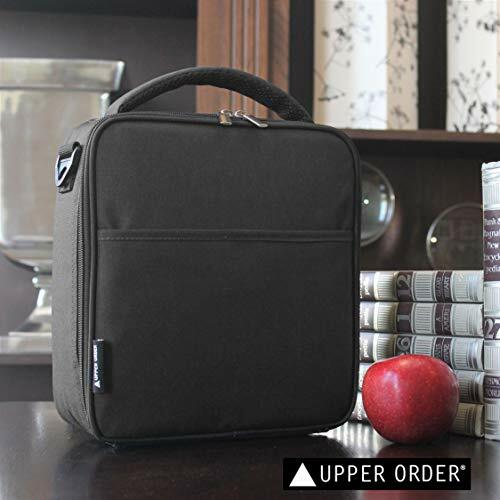 25% LARGER: This premium lunch bag offers almost 25% greater storage space than similar looking lunch bags. The perfect size... not too big and not too small. 11.0" H x 10.0" W x 3.6" D dimensions offer a generous 6.5L of storage space... the largest when compared to similar lunch bags. Enough space for a hearty lunch and drink. Fits conveniently on small refrigerator shelves and into backpacks. CLASSICAL PROFESSIONAL STYLING: Durable fabric lunch bag is made to look good in business and casual settings and ideal to pack lunch, snacks, and general items for the office, school, trips, and more. Dark color heavy-duty oxford cloth canvas fabric resists stains and hides grime. Cleans us up easily with soap and water. MADE-TO-LAST ZIPPER: Many poor-quality zippers stick and ultimately become the weak link where many lunch bags break. The rugged quality of the upgraded zipper on this lunch bag will provide years of long-lasting, trouble-free use. 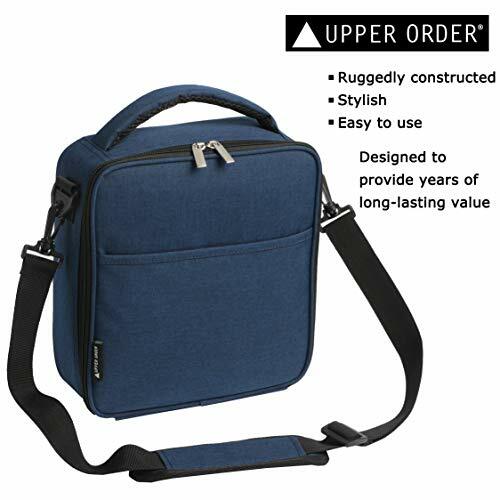 UPGRADED SHOULDER STRAP and CARRYING HANDLE: Premium stretch-resistant 4' long x 1.25" wide shoulder strap contains an adjustable padded cushion designed to improve comfort. 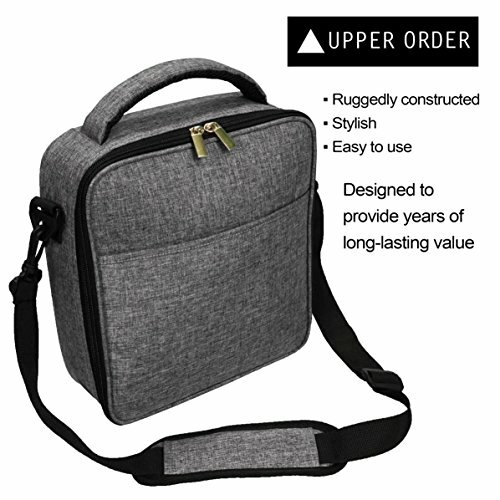 Well-constructed, soft fabric cushioned carrying handle feels good while carrying a packed lunch and will not hurt fingers and palms like handles made with abrasive strapping and rough fabric. RIP-RESISTANT LINER: Heavy-Duty Polyester Aluminum foil food-safe lining is more durable and resists rips and tears greater than insulating materials typically found in other lunch boxes. Thick insulation keeps food cold or hot for hours. 100% SATISFACTION GUARANTEE or we'll gladly provide a refund or exchange if you don't agree that the size, durability, look, and overall quality of this lunch bag make it a perfect match for your needs.